Was the Declaration a Legally Binding Document? 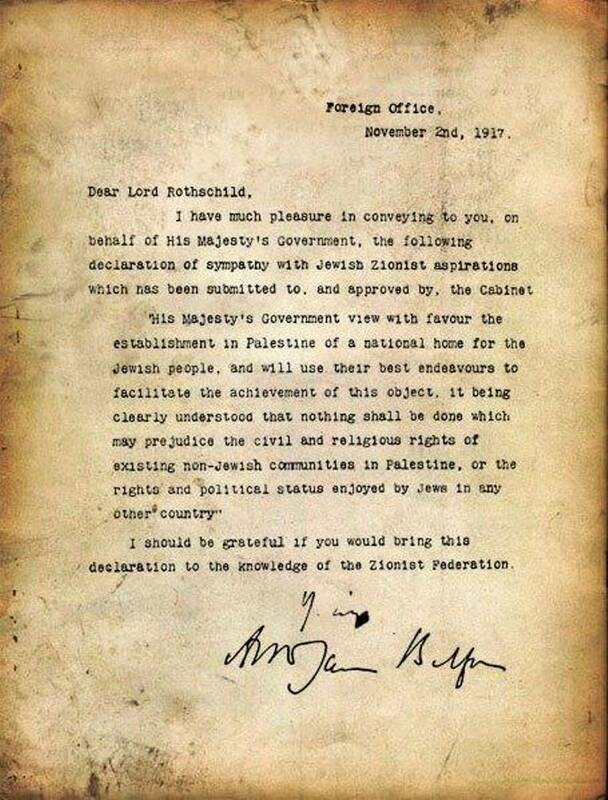 From the Balfour Declaration to a Palestinian State? On November 29, the Jerusalem Center for Public Affairs and The Henry Jackson Society co-sponsored a standing-room-only event at the British House of Commons to refute Palestinian attempts to demand nullification of the Balfour Declaration. Prof. Andrew Roberts read modern history at Gonville & Caius College, Cambridge, from where he is an honorary senior scholar and PhD. He has written twelve books. He is a founding member of the Friends of Israel Initiative. In 2016 he won the Bradley Prize. has spent most of his life combating terrorism and insurgency. He was Commander of British Forces in Afghanistan in 2003 and between 1979 and 2006 commanded troops on operations in Northern Ireland, the Balkans, Iraq and elsewhere in the Middle East. served as a member of Israeli diplomatic delegations to the United Nations General Assembly and to international committees. She participated in the negotiations for the peace treaty between Israel and Egypt and for the establishment of the multinational force in Sinai. In 2006 Lapidoth won the Israel Prize for Legal Research for her academic and public work. is Charles Evans Hughes Visiting Professor of Government and Jurisprudence at Colgate University. He teaches courses in international law and American foreign policy. In addition, he is a Senior Research Scholar at the Yale Law School. is the principal and founder of Gauthier & Associates, an international law firm established in Toronto, Canada, in 1984. He has spent decades promoting the legitimacy of the Jewish claim to Jerusalem under international law. taught aeronautics at the Technion. From 1962 until 1971 he was Deputy Director General at Israel Aircraft Industries, and won the Israel Defense Prize in 1971. He served as Israel’s Ambassador to the U.S., 1982-83; Minister of Defense, 1983-84, 1990-92, 1999; Minister without Portfolio, 1984-88; and Minister of Foreign Affairs, 1988-90.
is an Israeli diplomat and international lawyer. He served as the Israeli Ambassador to the United Kingdom from 2011 until 2015 and is currently Director of Strategy and Planning of the Yad Hanadiv foundation. is Director of the Project on Regional Middle East Developments at the Jerusalem Center. He was formerly Director General of the Israel Ministry of Strategic Affairs and head of the Research Division of IDF Military Intelligence.